A customer who recently migrated to Exchange 2010 and was still in the co-existence setup with Exchange 2003, reported lots of users experiencing issues with regards to Free/Busy information. Symptoms were inaccurate or missing Free/Busy information, which especially gets annoying when scheduling appointments. It turned out these users were using Outlook 2003; users on Outlook 2007 or later experienced no issues. As you probably know, Outlook 2003 still utilizes public folders to publish users’ Free/Busy information. This information is consulted by Outlook 2003 when scheduling appointments; Outlook 2007 or later uses Exchange Web Services for this purpose. This told us Exchange was unable to store Free/Busy information in a public folder, in this case /o=EUROPE/ou=First Administrative Group. 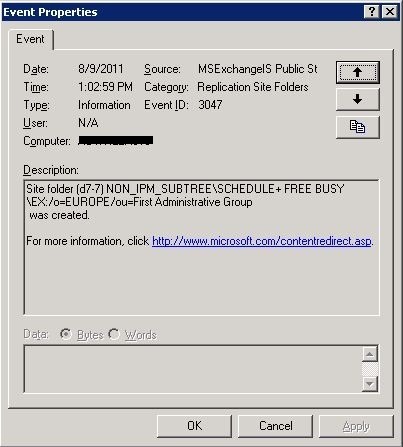 A quick look at the Public Folder Management Console in Exchange 2010 showed that the folder didn’t exist. 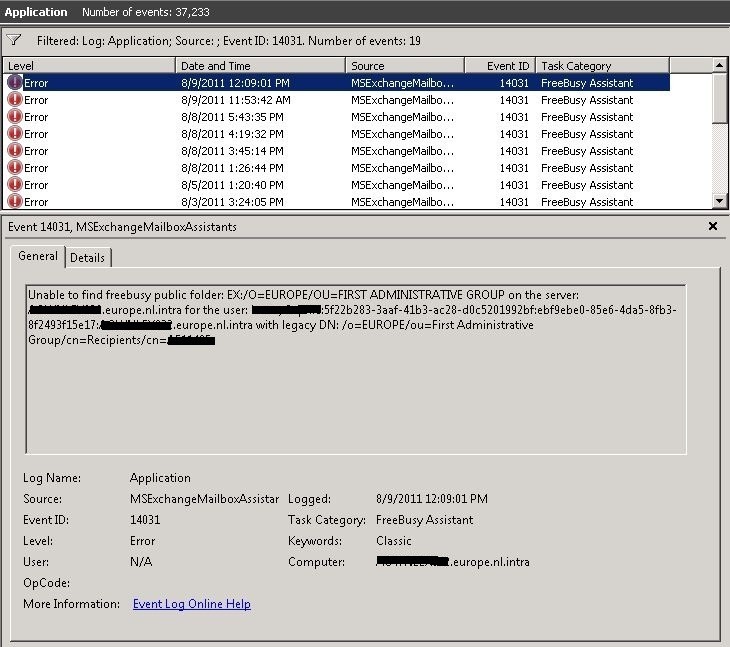 Since the Free/Busy public folder to be used by an Outlook 2003 user is determined by the legacyExchangeDN attribute, this was the cause of the issue. The reason for the folder’s absence was unknown so one can only speculate. My best guess is improper decommissioning of the organization and administrative group originally hosting those users, identified by that “orphaned” legacyExchangeDN. Recreate the Free/Busy public folder. The 1st option has consequences for the users, like being able to reply to earlier e-mail by co-workers. This can be resolved by adding the current legacyExchangeDN as an X500 address to the current set of e-mail addresses, but that also makes things a bit messy. Finally, don’t forget to create replicas of this new Free/Busy public folder when appropriate. This entry was posted in Exchange 2003, Exchange 2010, Misc and tagged Exchange2003, Exchange2010, Migration, Outlook2003 by Michel de Rooij. Bookmark the permalink. Great diagnostics. I have added your blog to my website. Keep up the good work Michel!